MP3 Cutter for Windows XP - a program for fragmenting audio data by specified parameters. The application contains visualization tools for manual installation of the beginning and end of the segment, allows you to create a fragment of a certain volume or a fixed duration, supports batch conversion, followed by conversion to mp3 format. The utility allows you to add tags to the generated files, use drag and drop, includes pre-listening with the ability to repeat the fragment. The program does not require installation, has a simple interface with support for hot keys. 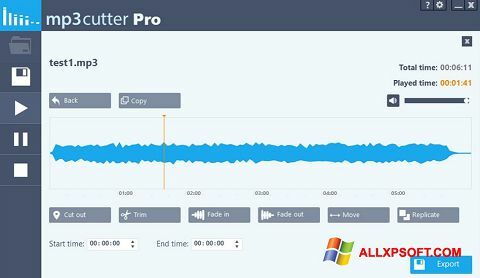 You can free download MP3 Cutter official latest version for Windows XP in English.